Rio Grande City Police Chief Noe Castillo addresses the media at a press conference at City Hall Wednesday, Aug. 16, 2017, in Rio Grande City. 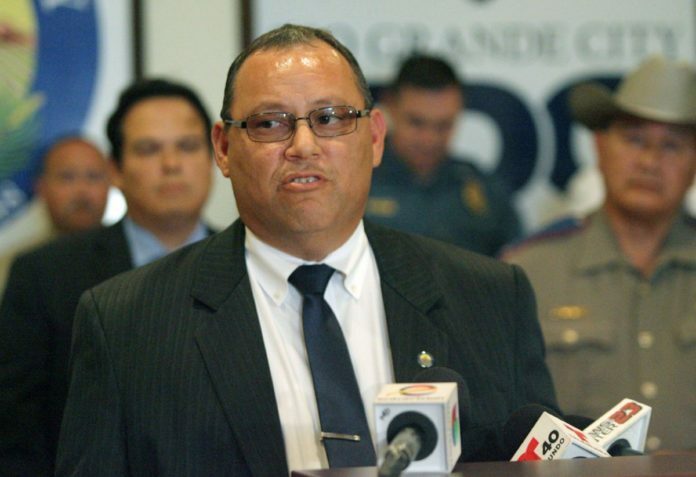 Law enforcement are expected this afternoon to address several arrests made yesterday in Rio Grande City, according to Rio Grande City Police Chief Noe Castillo, director of the Starr County Special Crimes Unit. Two arrests were made following a police pursuit that led to multiple collisions. Police were also present at the Rio Grande City school district offices yesterday at Fort Ringgold; however, law enforcement have not confirmed whether the two incidents are related. The collisions occurred Tuesday afternoon after an undercover police unit pursued a vehicle with two suspects, according to SCU Commander Robert Caples. The undercover officer collided with the suspects, who continued to evade authorities until crashing with another vehicle. The two suspects were arrested and charged with possession of marijuana. One of them was also charged with evading arrest. Only minor injuries were reported.